So, too much hardware? Too much pedantic science and insistence on accuracy of background? Well, there is a sense of scientific rigour, there are no vast and wondrous extra-terrestrial civilisations, there are no ray guns and square-jawed heroes. And to cap it all, there are factual articles to give the book even more scientific credibility. But most importantly, there is humanity and heart. Each of these stories is set in a world of very convincing scientific advancement, and while that framework is extremely important and effective in painting each individual world, it is the people, the characters, that are the ultimate focus. In ‘Sea of Maternity’ by Deborah Walker, for example, we have an intriguing glimpse of the rigours of living in a lunar colony. Innovative ways have been developed to protect the inhabitants from lethal washes of radiation sent out by the sun. The first generation have survived and the second are growing up through adolescence toward adulthood. Yet all is not well, the children of the moon are as restless and rebellious as their earthbound counterparts. This is a marvellous story, and in a few thousand words, ‘Sea of Maternity’ gives us the vast backdrop and convincing history of the colony, and at the same time focusses tight into a fraught mother-daughter relationship that encapsulates the whole issue of lunar colonisation. The International Space Station features in two stories, although both are slightly flawed, one of them, ‘Final Orbit’ by Nigel Brown, has a beautifully tense build-up to a surprising dénouement that doesn’t quite work for me. The other, Dr Philip Edward Kaldon’s ‘The New Tenant’, featuring (I can’t put my finger on why) a somewhat irritating heroine in a genuinely compelling situation. ‘Dancing on the Red Planet’ by Berit Ellingsen shows that even writers of hard sf have a well-developed sense of humour. This is the tale of the first men to set foot on Mars, and how they celebrate their Great Moment. There is also ‘Going Boldly’ by Helen Jackson which relates the adventures of Frankie, a Character Technical Director: Alien Morphologies in a software gaming company, when she is sent on a quest to study real life anatomy in an effort to enhance the latest game. Contemporary issues are confronted in the very even-handed and powerful ‘Conquistadors’ by Iain Cairns, when the rights of humankind to rip vital resources from other worlds are in passionate dispute. Surely this is one of the true functions of science fiction, to analyse present day issues and examine them from the fresh perspective of the future, or by looking in from beyond the boundaries of our own familiar world. The factual articles are utterly fascinating and every one, lively and compelling. For example Eric Choi’s ‘Making Mars a Nicer Place’, or Bill Patterson’s ‘A Ray of Sunshine’, which explains the almost insurmountable problems of solar radiation in space. A canny ordering of the fiction placed some relevant stories adjacent to these articles. One story, however, placed itself halfway between fact and fiction; ‘Dreaming at Baikonur’ by Sean Martin is a very human and moving account of a Russian rocket scientist and his brutal vicissitudes through the dark days of the Stalinist era. Definitely one of my own favourites. Terry’s choice was a tough one to make. The opener, Leigh Kimmel’s ‘Tell Me A Story’, the tale of a children’s book through the centuries, took a place in my reading heart. Martin McGrath’s ‘Pathfinders’ is an intense, moving story of another Mars mission. However, The One is a very clever and convincing retelling of the Space race. I will not give the game away or even reveal the title because the joy of this story are the surprises and trip wires it stretches across the reader’s path. My recommendation? 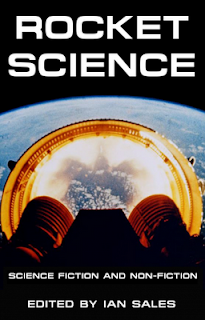 Even if you are put off by the term “Hard SF” and are nervous of negotiating zero-g, aphelion, radiation, weightlessness and the dynamics of re-entry, give this book a try. The hardware, the steel and plastic actually emphasise the sheer fragile-yet-iron tough humanity of its protagonists. The real winner here is the human spirit.